Interests - Playing on Nintendo DS, teenage ninja turtles, swimming, riding his mini Shetland, going to school, stickers, books, animals and sugar gliders. Visually/hearing impaired? - Yes - Moderate to severe hearing loss in both ears due to side effects from chemotherapy. We are very sad to say that on the 14th of June 2008 Daniel passed away in his mothers arms, after nearly 3 years of battling Neuroblastoma. Daniel was diagnosed in October 2004 just after his 2nd birthday. We spent a total of 5 weeks at Birmingham Children’s Hospital, and then we got to go home and face family and friends who found it awkward to talk to us.We then got our treatment plan and it was a very intense year – 7 courses of chemo 10 days apart. Daniel seemed to handle what ever the nurses threw at him, kids are amazing! Next he had the surgery to remove his tumour which had connected to his right kidney. It was February already and it turned out to be the longest day of my life, 12 hours of surgery. Daniel was very weak and stayed in hospital for 9 days. We then had 2 weeks at home to relax and find some normality. March came too fast and we had 15 days of radiotherapy at Queen Elizabeth Hospital. My heart was with him and it was so hard for me to watch him go through all this with no choice, you want what’s best for your child. Daniel then endured 6 months of Accutane which made his mouth and face extremely sore and before we knew it, it was November and the end of his treatment. 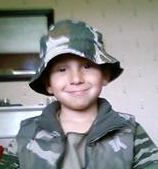 Sadly in November 2007, we found out Daniel had relapsed and he has had to start chemo again. Thank you Post Pals and to those who have and to those who still are sending cards. The 14th of June was a very sad day. Daniel has just finished his second round of chemo and has nearly lost all of his hair. He has gone back to the small thin boy I knew 3 years ago. He is eating again now and trying so hard to avoid the nasal gastric tube. I would like to say a very big thank you to everyone that sent Daniel cards, letters and presents. He has watched out for the postman every morning since I put his name down for Post Pals.